ZIMBABWE – Mrs Mujuru, 60, was seen as Mr Mugabe’s likely successor until she was sacked from her post as vice president and expelled from the ruling Zanu PF last year after Grace Mugabe, the first lady, repeatedly accused her of plotting to assassinate the president and stage a coup d’état. More than 140 Zanu PF leaders and officials were sacked in the subsequent purge. 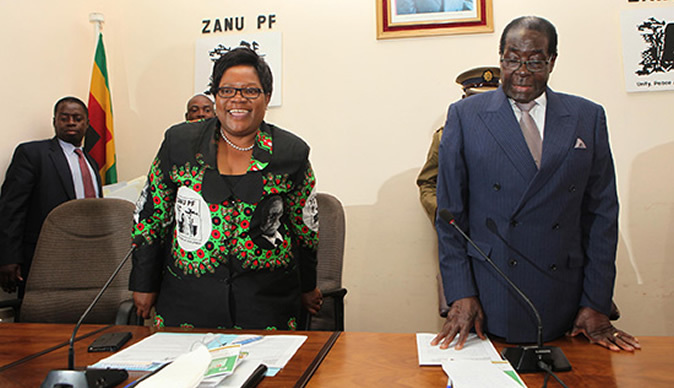 Mrs Mujuru, who joined Zanu PF as a teenager when she fought in the war against white-ruled Rhodesia, served in Mr Mugabe’s cabinet from independence in 1980 and became vice president 11 years ago. Prior to her ouster from Zanu PF, many believed she had widespread support in the party and would be a popular heir to Mr Mugabe when he died or retired. That was until Mrs Mugabe, linked to various factions in Zanu PF, took to the streets last year and went around the country accusing Mrs Mujuru of plotting to take over the government. She also said she was close to Mr Mugabe and that she saw herself as his “daughter”. But she had been shocked and grief stricken, as was Zimbabwe, when her powerful husband, Solomon Mujuru, the only party senior who ever challenged Mr Mugabe, died four years ago in a mysterious fire at the formerly white-owned farm he took over in 2003. “We have been working quietly to bring this party to the public,” said Rugare Gumbo, former Zanu PF spokesman who was expelled by Mr Mugabe last year. So far Mrs Mujuru has not publicly announced her involvement with the new party. “Be patient, that is coming,” Mr Gumbo said. The prospect of the new party has been welcomed by other political groups in the country, including Zimbabwe’s official opposition, the Movement for Democratic Change (MDC). Tendai Biti, former secretary-general of the MDC who now heads up another opposition group known as the Renewal team, said that as a former freedom fighter, Mrs Mujuru would lend considerable weight to the political opposition. “We welcome the expansion of democratic opposition. So often change in Africa only comes through the barrel of a gun. We in the opposition lacked the forces of the old nationalist movements which fought for freedom. So Mrs Mujuru’s entry into politics completes the picture and now we have the nationalists on stage helping us to dislodge the old order. To democratise Zimbabwe, and create a new society.